Thailand attracts lovebirds from near and far. Has Thailand already been on the list of your honeymoon trip? Wonderful! If not, stop right here to read and re-evaluate. The best islands for honeymoon in Thailand will definitely fulfill your dream. Phuket Island, the largest island in Thailand and the greatest treasure in Andaman sea continues to attract people from all over the globe with its baby powder sand, turquoise sea water, myriad watersports, colorful shores and romantic beach resorts. It is not just romantic Thailand honeymoon island itself, but also a gateway to other islands. Patong Beach is the heart of Phuket. Although there are always lots of tourists and sometimes parking is impossible, it is really worthy of an experience at least once. There are two things are very famous and one is liveliest beach, the other is the wild nightlife. You can try jet skiing, parasailing, or just rent a sunbed to relax for few hours. When nightfall, the beach and the area around become more and more busy. 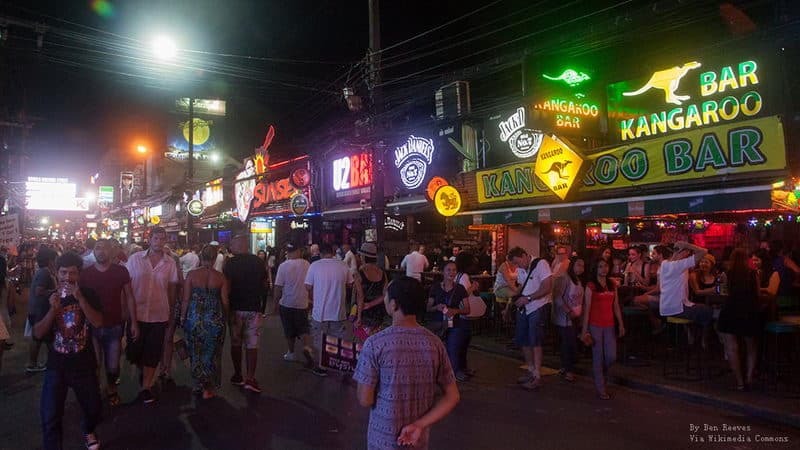 The nightlife centers – Bangla Road where you can see many ladyboy strutting their stuff whilst enjoy a drink or two. Karon view point is the most popular viewpoint in Phuket. If you like viewing white sandy beaches and crystal blue sea, go to the point without any hesitation. The viewpoint shows you the Andaman Sea in one direction and the other direction points towards the three west coast beaches on the other side of the island. Phang Nga Bay is a must-go place when you are in Phuket. The famous James Bond Island is one of 40 small limestone tower karsts that come straight out of the water in the Phang Nga Bay. This area is full of mangroves, limestone caves and lagoons which is quite worthy for you to take cruise there to admire the craggy stalactite formation and you can canoe in the Bat Cave or Mangrove cave and you can enjoy swimming in the sea. You can also take out a sea kayak with a guide especially kayaking at nightfall when the rock formations are bathed in moonlight which is very romantic. 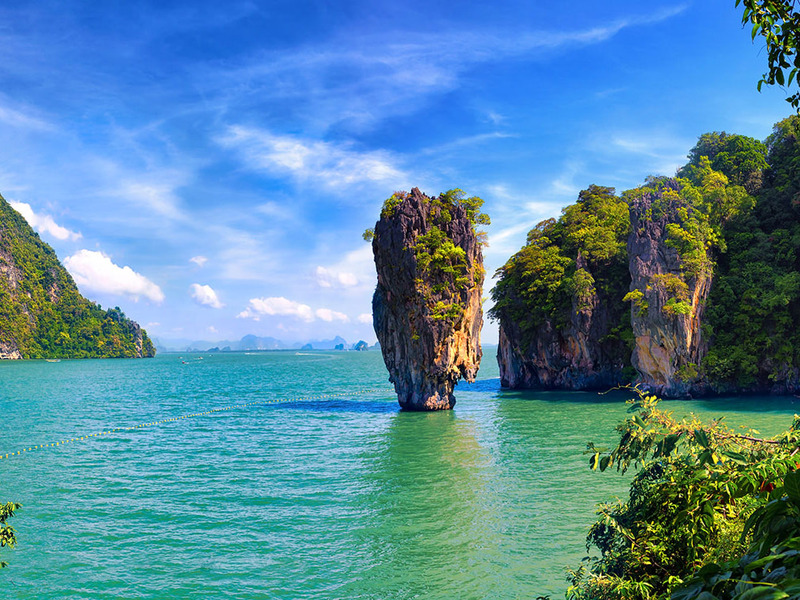 The 1974 James Bond movie – The Man with the Golden Gun – featured Koh Khao Phing Kan and Koh Tapu. Ever since, these islets have been famous as the James Bond Island. Every person wants to get close to the lovely elephants when visiting Thailand. We really do not recommend riding an elephant! But we suggest you to get close to these giant creatures in Elephant Jungle Sanctuary where you meet them, learn all about them, feed them, play with them and support them in an ethical way. New couples may like to wander around a night market to find something special. It will be very interesting. There is a night market called Naka Market located just a little way from Phuket Town which is very popular and out of the ordinary. No matter Locals or tourists like it. You can nearly buy everything hear, such as old curiosities, fruits, Thai street food, animals and clothes. You’d better arrive at late afternoon to ensure you get a good look around before it become packed. Ladyboy and ladyboy show only can be seen in Thailand. It is quite special and newlyweds never miss it. The famous Simon Cabaret show has been performing night after night with the most beautiful ladyboys for over 20 years in Phuket. In the one hour’s spectacular cabaret, you will enjoy a vast visual feast. Walking around the old Phuket town hand in hand with your lover could be very romantic. Created during a boom many years ago when metal was a valuable commodity, the town is rich in culture and history where you will see an abundance of Buddhist temples, beautiful boutique shops, and a disused red light district. The town is small so you can walk around it rather than taking any transport. There is a large selection of restaurants in the small town so that you can stop at any of it you like. Lying in the Gulf of Thailand off the east coast the Kra Isthmus, Ko Samui is the second largest island in Thailand. It is famous for its palm-fringed beaches, coconut groves and dense, mountainous rainforests, posh spas and luxury resorts. When a dazzling orange sunset shining upon you and white sand going through your toes, this must be one of the most romantic moment during your Thailand honeymoon trip. 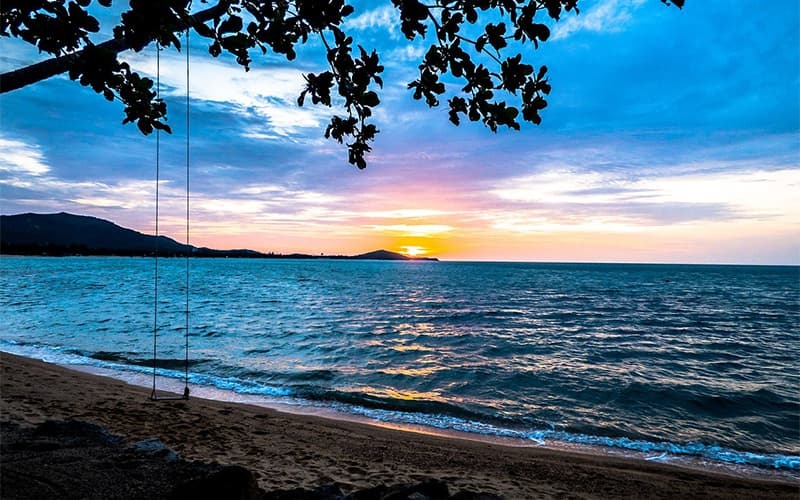 Honeymoon in Koh Samui wouldn’t be complete without mentioning the stunning sunsets. Opposite to Chaweng Beach and anywhere around Nathon Town, Lipa Noi Beach or Taling Ngam Beach in the west side of the island will provide you stunning views. Having a sunset drink with your spouse by the sea for this unforgettable moment. Renting a scooter or a motorbike and driving around Koh Samui is the best way to discover the island. With the scooter of motorbike, you can explore the island at your own pace, and you will find great places to visit, to stop for a fresh coconut or for an awesome shot. You can ride it going north and northwest to visit Chaoen Mon Beach, Maenam Beach and the Bophut village and to Chaweng Beach. The pristine beaches in Koh Samui always invite you to spend a whole day soaking up the sun and discovering the colorful underwater life. Sailing, diving, snorkeling, or kayaking… Going on a day trip to visit beaches and small islands around Koh Samui, you will get a perfect snorkeling experience. Nightlife in Koh Samui is diverse with fancy options which will make your honeymoon trips in Thailand more colorful. You can dance the night out with your spouse at the most famous beach bar/clubs such as Ark Bar and Cha Cha Moon. Around the town there are plenty of bars serving anything from cheap drinks to elaborated cocktails. If you are at Lamai Beach, the Beer Bars Plaza is a good option for a few drinks. It doesn’t matter what your style is, just go out for fun at night and try different spots to discover the nightlife in Koh Samui. Koh Samui is the nearest island to Koh Phangan and it is the most popular place people choose to go to Koh Phangan from. If your honeymoon in Koh Samui happen to meet Full Moon Party, go definitely by a ferry or a speed boat to enjoy the unique crazy party on the beach in Thailand. You will never regret to do it. 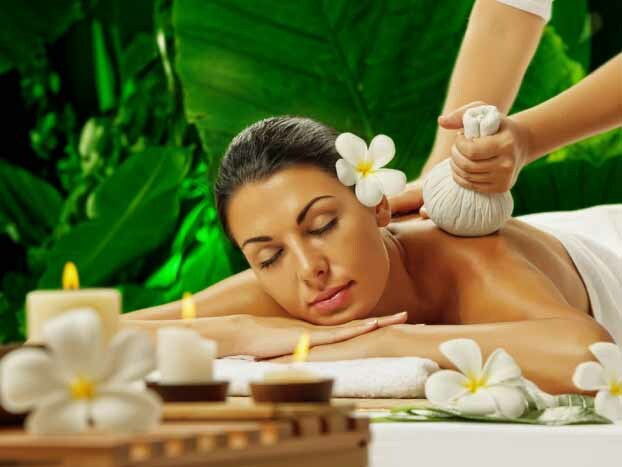 After doing many things, we think, you must feel tired, then a spa or a traditional Thai massage is what you need! Check if your hotel has a spa, or walk to some of the massage parlors near you and you can get your body and soul pampered. Krabi, a province with hundreds of islands, is a treasure of beaches, adventure, heritage and pristine natural beauty. It offers a wide range of experience including relaxing stays, sightseeing, and adventurous activities. Different types of couples might have different expectation from their honeymoon. Let’s see what activities suit you in Krabi. Built in the year of 1887, Wat Kaew Korawaram is one of the largest temples in Thailand in the downtown of Krabi. It is perched on a hill and the staircase is beautified with golden Naga sculptures and the views will overwhelm you as you climb upstairs. There is a narrow canals of blue green water surrounded by mangroves on the sides in the beautiful Ao Thalane village. You can explore secret lagoons by canoe in Bor Thor. This half day adventure takes you to find the undiscovered gems of Krabi through the off the beaten path. New couples who love scuba diving must come to Krabi. Diving into deep sea and exploring its magical silence and beauty is regarded one of the most romantic things in Krabi. Islands of Krabi are regarded the best place to admire the various marine life residing in the crystal blue waters. It will reward you a different honeymoon. Couples who like extreme adventure, come to Hollow mountain extreme adventure park where you will trek and zipline up to the cliff, while you might be scared during the time of zipline, however, the views from up above the cliff will overwhelm you and your fear will vanish in a blink. There might not be a better romantic place than here where the chirpings, and the song of a flowing river always strike the chord. Krabi is such a place full of natural pleases and romance. Explore the colorful caves with multiple formations in Krabi with your lover will memorable experience from your honeymoon in Krabi even if you have done caving before. Tiger Cave Temple is a cultural heritage that is untouched and unspoiled by modernization which preserves the immaculate carvings and the prayer hymns have the power to touch your soul. It is one of most sacred spots in Krabi. It will be most unforgettable place for heritage hunters to spend their honeymoon. 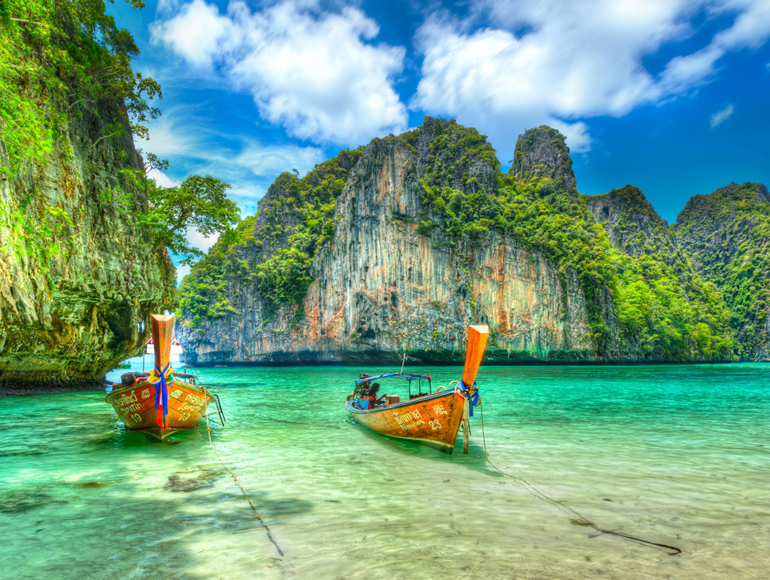 The Phi Phi islands are also the best islands for honeymoon in Thailand near Krabi. Koh Phi Phi Don is the largest and the only inhabited island in the group, but Koh Phi Phi Lee is the most awesome one and the famous Hollywood flick “The Beach” was filmed here. Located in the 51-island archipelago of Tarutao Marine Park, Koh Lipe is another popular island in Thailand for honeymoon. Newlyweds can take island hopping tours to Koh Phi Phi, Koh Nagi, Koh Mook and so on. Plan a Thailand honeymoon including some programs in the islands will be marvelous. However, different types of couples might have different expectations from their honeymoon. We hope this article will give some ideas for choosing a suitable island for your honeymoon in Thailand.